As May 26, 1992, saw the initial departure of the Radisson Diamond, so this Saturday marked the twentieth anniversary of what is now Regent Seven Seas Cruises. We take a brief look at the important events that have shaped that line over the past two decades. Also this weekend, Sophia Loren baptised the new MSC Divina in Marseilles and the ms Hamburg departed Nice on her inaugural voyage for Plantours & Partner. She will be officially introduced to the German market at an event to be held in Hamburg in early June. Finally, the Cruise Examiner is on board Croisières de France’s new Horizon and will report on this latest French cruise ship next week. Just as in 2010 Crystal Cruises and Celebrity Cruises celebrated twenty years, so now it is the turn of Miami-based Regent Seven Seas Cruises, today part of Prestige Cruise Holdings. 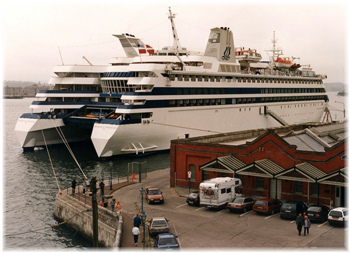 First launched as Radisson Diamond Cruises, the line began service on May 26, 1992, with the 354-guest twin-hulled Finnish-built Radisson Diamond. Management was at first supplied by a partnership of Radisson Hotel Corporation, part of the Carlson Group of Minneapolis, and the ship’s initial owners Diamond Cruise Ltd. And present Regent Seven Seas president Mark Conroy was involved right from the start. Two years after its formation, in 1994, Radisson Diamond Cruises merged with Seven Seas Cruises, which was operating the 180-berth all-inclusive Song of Flower. In 1996, Carlson acquired the Radisson Diamond from Finnish bankers and then also took over management of the French-owned 320-guest Paul Gauguin. 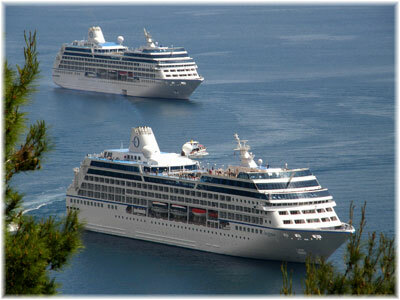 In the late 1990s, Radisson and the Carlson Group entered into a partnership with Monaco-based V.Ships, which resulted in the present fleet, consisting of the 490-guest Seven Seas Navigator in 1999, and the 700-guest Seven Seas Mariner in 2001 and Seven Seas Voyager in 2003. These ships essentially replaced the previous three fleet members, Radisson Diamond going to the Far East, Song of Flower first to Ponant and more recently to Clipper Group, who will now operate her as Quark’s Ocean Diamond (there is a slight irony in her name) while Paul Gauguin now operates for new owners in the US. In 2006 the line changed its name to Regent Seven Seas Cruises, a title that reflects much better its positioning in the marketplace. In more recent years, the Carlson Group has sold out to Apollo Management of New York, which also owns half of Norwegian Cruise Line, and Regent has found its way into the new Prestige Cruise Holdings. Sister company Oceania Cruises has recently introduced two newbuildings of its own, the Marina and Riviera, and operates two of the original Renaissance ships Nautica and Regatta. A third sister ship, Insignia, is on two-year charter to Hapag-Lloyd Cruises and since last month has been operating as Columbus 2. Regent Seven Seas is now known as the most all-inclusive of the ultra-luxury lines, including as it does shore excursions as well as gratuities, port charges and beverages. And it is reported that negotations on board Oceania’s new Riviera earlier this month between Prestige Cruise Holdings, Regent Seven Seas and Italian shipbuilders Fincentieri may result in the next newbuilding for Regent Seven Seas, which would be the first new ship for Regent in a decade. Among the many events in Marseilles this weekend, on Saturday Sophia Loren baptised the new MSC Divina, a ship that has been named for the great screen actress herself. One of the new ship’s features is a Sophia Loren suite, which includes a replica of Loren’s dressing table. 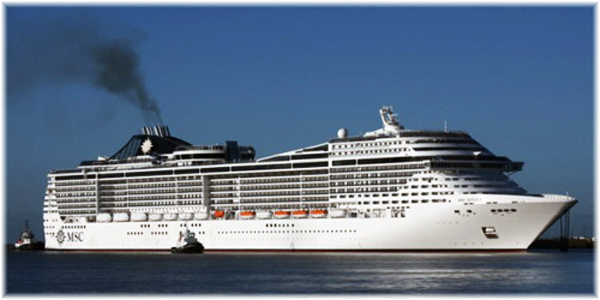 MSC Divina is the ninth MSC ship either to be named or renamed by Sophia Loren. Named at 1900 hours on Saturday the event was capped by a flypast formation in what appeared to be the shape of a cross! Also in port on Saturday was the ms Hamburg, which had jst left Nice on her maiden voyage for Plantours & Partner on Friday. Her inaugural cruise is a 7-night voyage from Nice to Lisbon. 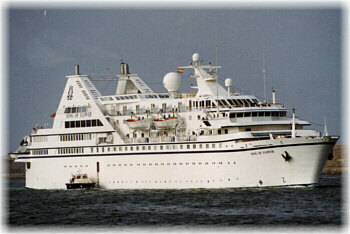 Eventualy she will be officially renamed at an event in Hamburg in early June. The Hamburg operated from her christening in 1997 until earlier this month as Hapag-Lloyd Cruises’ Columbus. Finally, The Cruise Examiner left Marseilles on board Croisières de France’s new Horizon on Sunday with a group of twenty-four travellers from the Ocean Liner Society and will report on the French line’s latest acquisition next week.